Our need for warmth draws us and keeps us together, sprawled where the seating is too limited for six, the noise levels too much. The dog, also, is there, taking up more than her fair share of the love seat. 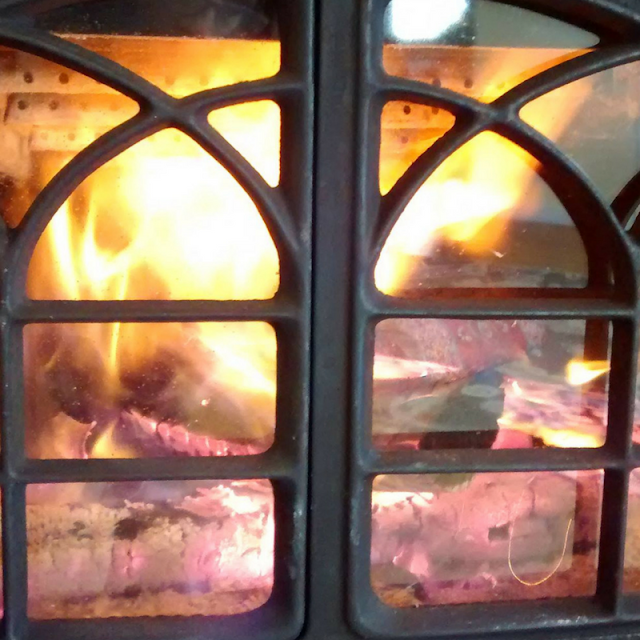 In the corner, the wood stove ticks as the cast iron absorbs a slowly growing fire’s flames. On the coldest mornings, the twins stand directly in front of the stove, blocking its window’s orange glow. The older children stand within a foot, one on either side, squeezed between the wall and stove. The smell of drying laundry fills the room as their clothes absorb the pulsing heat. They stand until their pants are so hot they can barely walk and sitting down, forcing the hot cloth against chilled skin, ceases to be an option. This is how we start and end each of winter’s darkening days, as the sun slips its way to and from arctic nights. During the day, our circumference expands. With time, heat grows, and the kitchen, the laundry, the sun-warmed front room, all become habitable and we spread, easing into the furthest reaches. But, when the sun sinks, we return. Our need for heat draws us into the heart of the house, into the space of one another, into the stove’s orbit again where we hover until need is met. These winter days, I find myself grateful for the warmth and the need that gathers us around our own glowing sun. Need is also a gift and, often, the clearest path to communion with others and with God, who draws us also; God, like a great pulsing heart, a glowing sun, a wood burning stove, drawing us all close and closer yet. "Need is also a gift and, often, the clearest path to communion with others and with God, who draws us also; God, like a great pulsing heart, a glowing sun, a wood burning stove, drawing us all close and closer yet." Beautiful, Kelly! Your words always are! Or if not beautiful, quite humorous!